As Jesus Hernandez crossed the line on the Yas Marina Formula 1 circuit in Abu Dhabi last weekend it signaled the end of an era. The last Tinkoff rider in the team’s last ever race. Dressed in the retro yellow, white and black kit designed to recall the team’s original colours, it was an emotional finish for the riders and staff of a team which has been a formidable presence in the peloton for over a decade. 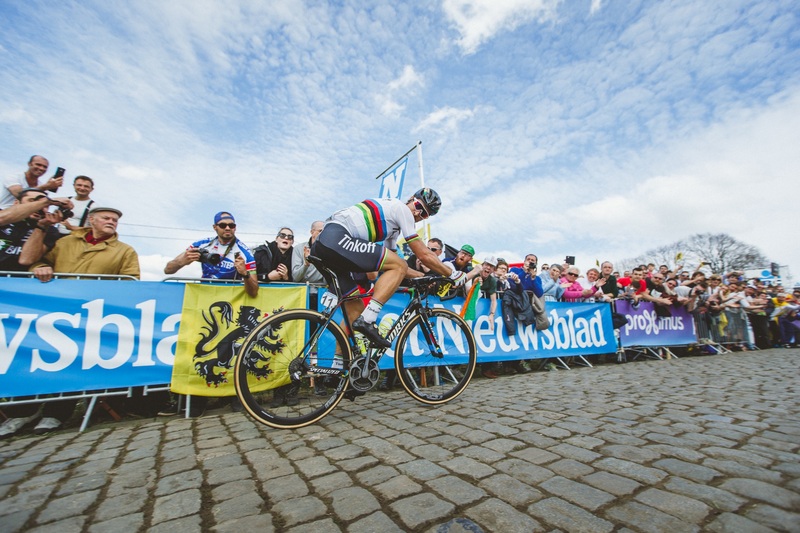 With their impressive 2016 palmares you can’t say they didn’t go out with a bang – Double World Champion, European Champion, Points Classification at the Tour de France, Eneco Tour, Tirreno-Adriatico and Tour of California, Winner of Ronde Van Vlaanderen, Gent-Wevelgem and 3 Tour stages – that’s just one of their riders – of course the incredible Peter Sagan. Add the 5 national champions, various stage & tour wins (in total 34 victories) and you can see that they did not ease up in their final season. Sportful have been with the team since 2010 when we rejoined the World Tour after a very successful run with the Italian National Team. Whilst we were extremely happy with the results we were looking for a team partnership that could help us continue our research into the performance requirements of athletes at the top level of the sport. This required working full time with a pro team, gathering feedback, testing products and understanding what improvements could be made to help the athletes perform even better. Well known for his attention to detail, Bjarne Riis of team Saxo Bank was searching for a clothing partner that was looking to innovate and find ways to give their athletes an edge. Riis gave us a year to show what we could do, in the end the team chose to stay with Sportful right to the end. Though staff and athletes change from year to year the passion and trust has always remained. Our work with the team has provided extremely fruitful, the aim has always been to create products that can survive the rigors of the pro peloton, offer an advantage in a variety of conditions and to take that technology and make it available to our customers. The trust built between Sportful and the team has let us to test prototypes in race conditions and allows the team to give honest feedback that makes a huge difference in product development. Together over the years we’ve developed some of our best products with the team, here’s a few of them. Our first ever project with the team. The BodyFit Pro concept is to give pro athletes the ultimate all conditions race clothing with the key aims of comfort and performance. Everything superfluous was removed, leaving only what the pros need to race. The result – the most comfortable race kit in the peloton with the added benefit of being one of the most aerodynamic kits too. Whether it’s the 100g Race Jersey that fits perfectly or the lay flat bib straps of the Ltd bibshort – you wont find a more comfortable kit with such incredible performance. The BodyFit Pro collection has expanded over the years with additions such as a one piece aero roadsuit, a super fast TT suit and winter kit for training but the core concept remains the same – comfort and performance. One of our R&D projects that isn’t necessarily going to be a big seller but is vital for the pro team. With jerseys getting tighter for aerodynamics and the use of skinsuits in road races becoming more popular it was getting more difficult to carry out the important job of being ‘bottle carrier’ during the race. 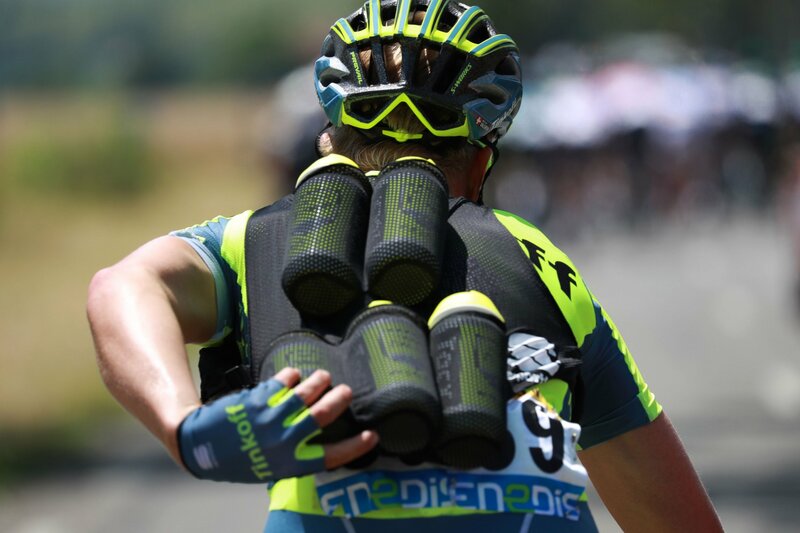 Tinkoff Saxo came to us for the answer – and just in time for the 2014 Tour de France we gave them the ‘Bottle Vest’. Made from a lightweight mesh and with the ability to carry 7 bottles per load it can be slung over the riders shoulder from the car in one move and once back in the peloton the other riders simply help themselves to the bottles, actually improving on effort, time and safety. How can you make a comfortable short that stays cool in the hottest weather without the risk of sunburn? That was the question from the team. For the increasing number of desert races, the hot summer climbs of the Tour de France and Vuelta we’ve always strived to make lightweight kit to keep riders cool, jerseys like the Ultralight and BodyFit Race, but shorts were a challenge. Instead of merely adding some mesh panels we decided a full leg construction in mesh would reduce the need for extra stitching, give an extremely comfortable support and allow for optimum breathability. The shorts will be available in Spring 2017. One of our last and longest development projects with the team. The Stelvio jacket was initially inspired by the terrible conditions of the Gavia-Stelvio stage in the 2014 Giro d’Italia. With freezing wind and snowstorms on the climbs and heavy rain in the valleys it was one of the toughest days on the bike for the pros. 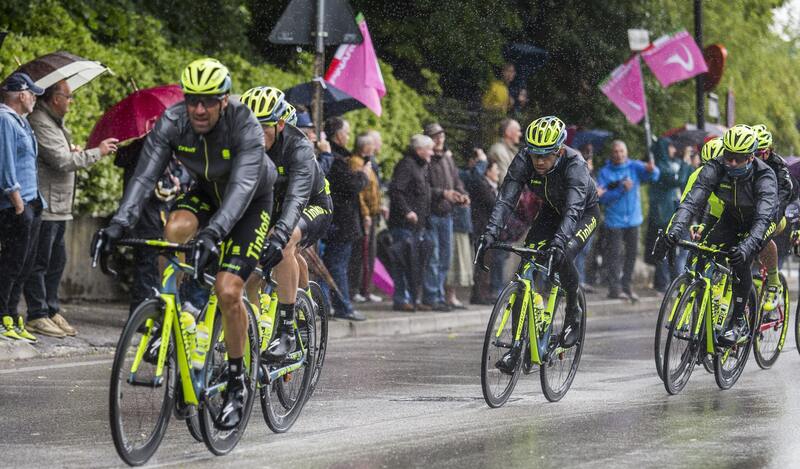 Whilst the Tinkoff riders were well protected, what we wanted to improve was their ability to race. This required improving fit, breathability and bulk. After 2 years of prototyping with different materials, cuts and closures we finally arrived at the perfect combination of protection and performance. The Stelvio jacket will be available in Spring 2017. 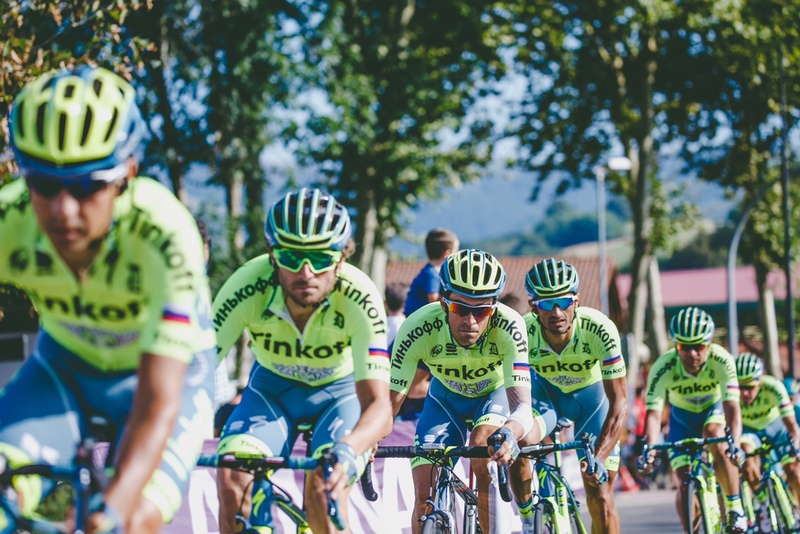 These are just some of the many products Tinkoff have helped us develop over the years. 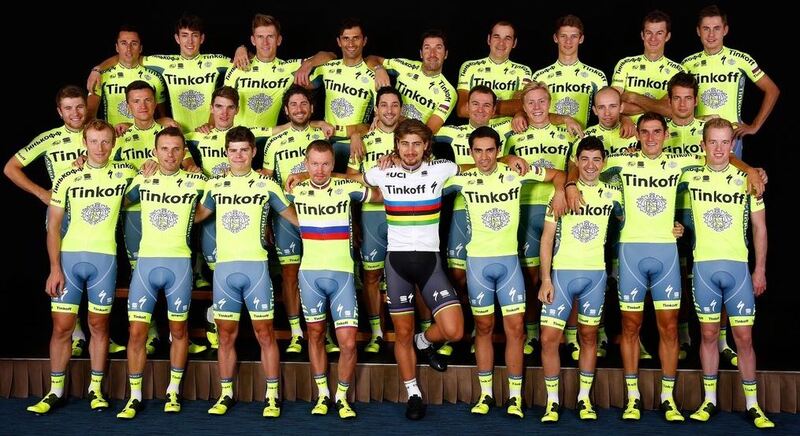 Sportful owes a lot to the hard working athletes & staff of Tinkoff Pro Team and we are proud to have been a part of their huge success, we wish them all the best in their future ventures, whatever they may be, they will always be considered part of the Sportful family. 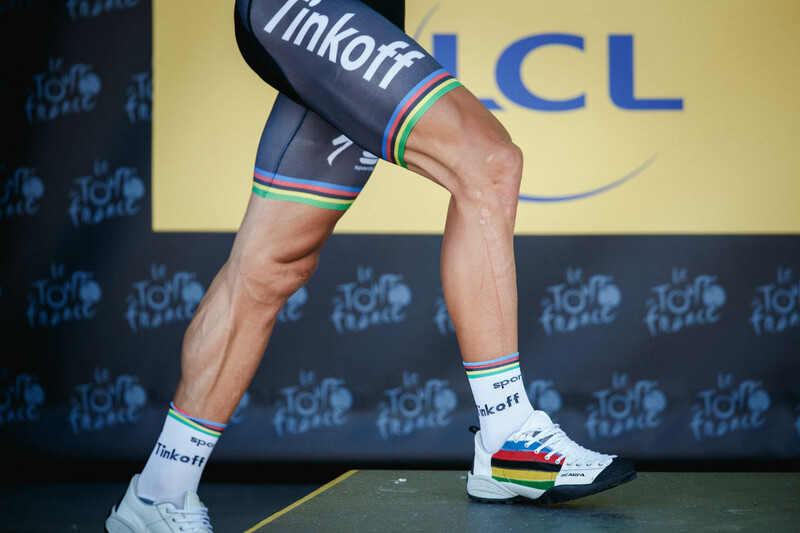 This entry was posted in Cycling and tagged Bjarne Riis, BodyFit Pro, bottle vest, cancellara, contador, hernandez, R&D Cima, Sagan, saxo bank, saxo sungard, sportful, stelvio, tinkoff, tinkoff saxo, tinkov. Bookmark the permalink. Hellow can you use de stelvio survival in cold weather without rain weather ? Hi Telmo, you can use it as a windproof shell but we would suggest that you use some thermal layers underneath to keep you warm.